This Green Garden Gold review provides you an inside into the quality and content of their products. Green Garden Gold is based in Texas. Green Garden Gold uses low-temperature CO2 extraction to preserve as many cannabinoids, terpenes and phytochemicals as possible. All products are GMP certified and regularly tested by third-party labs, which ensure high and consistent quality. Green Garden Gold uses the highest quality organically grown hemp from Colorado. Because their CBD is derived from hemp, the THC level is less than 0.3% which is the legal limit. However, Green Garden Gold also has THC-free CBD oils and products. For most products, they have posted the lab test results online, so you can convince yourself of the cannabinoid contents. Each Green Garden Gold product contains a full range of cannabinoids such as CBN, CBG, CBDv, CBC and naturally present terpenes which studies have shown to provide a better therapeutic effect than CBD alone. Such low doses of other cannabinoids cannot get you high but still provides health benefits. 30-Day money-back unused product refund guarantee. iDWeeds does NOT sell CBD products. We compare products from trusted brands to deliver you results based on strength, price/value and user satisfaction. As the CBD market is flooded with shady scam sites, avoid disappointment and the risk of a contaminated product. 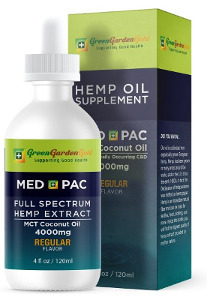 Med Pac CBD oils with MCT and coconut carrier oils – VG Blended CBD oils. 0% THC pure hemp extract terpene tinctures for less stress, calming and focusing. Full spectrum softgel capsules and Panidiol joint formula vegetable capsules. Good Day CBD Salve and HumanoFlow CBD Infused Gel. CBD dog oils, CBD joint formula capsules and CBD oil dog treats. CBD infused dietary supplements, Keytines+, Probiotics+ and MCT Powder+. Day Sunrise & Night Moonglow CBD serums. HumanoFlow CBD infused dietary supplement capsules for men and women. CBD crystalline with 99.9% pure CBD. 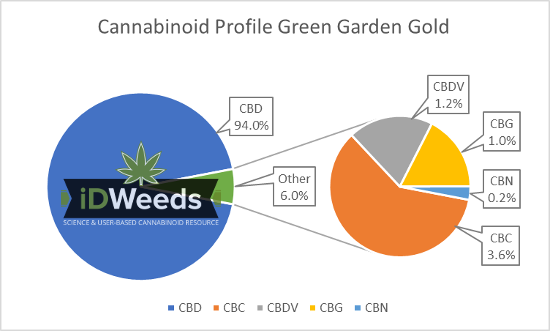 All Green Garden Gold products are quality tested by an independent third-party lab to ensure that you get the best product possible. A certificate of Analysis is available on their homepage. 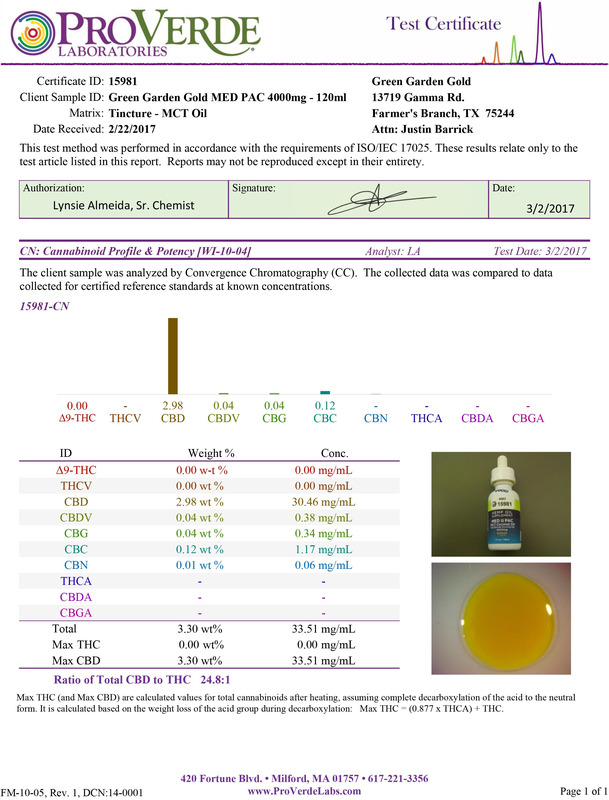 The below-posted cannabinoid profile is from the Med Pac full spectrum hemp extract with 4000mg CBD. It is THC-free but has a fair amount of other important cannabinoids. As you can see from the profile, the 4000mg Med Pac oil contains 3% of CDC which is a strong contributor to the overall health effects. The VG-tincture contains the legal amount of THC and a small amount of raw CBD (CBDa). For many years medical research only concentrated on pure compounds of cannabis. Tetrahydrocannabinol (THC) was mostly the focus of research. The cannabis and hemp plants consist of hundreds of other compounds, most of them with their own therapeutic potential. It is now scientifically proven that, when they are combined these compounds have the capability to induce synergic responses. This is called the “Entourage Effect”. Full spectrum hemp oils benefits are therefore obvious. Recent observational clinical studies on CBD epilepsy treatment shows that in certain circumstances a 50% improvement could be achieved with CBD-rich extracts -meaning full spectrum CBD- over pure CBD. 71% of epilepsy patients using full spectrum CBD reported an improvement in the frequency of seizures, over 36% using pure CBD. It might not be a surprise that patients reported lower average consumption of full spectrum cannabidiol as opposed to pure CBD. The synergistic effect of full spectrum CBD makes it more effective and reduces the overall CBD intake. Talk about natural optimization. We managed to negotiate big CBD discounts for our visitors. Enjoy our gifts! Plus many more inside your inbox, don’t miss out!